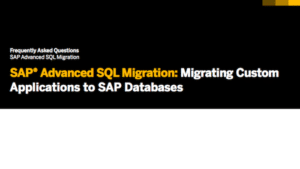 SAP’s Advanced SQL Migration tool greatly simplifies migration of custom applications to SAP, removing as much as 90% of complexities. Version 3 has just been released. For all of these source DBMS types, later (or earlier) versions than listed above have not been actively tested. The migration tool may however still work for such versions, or work partially. Find out more about Frequently Asked Questions. This excellent tool is available for use only by SAP and its partners. Get in touch to explore how it could help your migration project.